Making math fun can be seen as a challenge. But, I am here to say that is simply not true. There are many ways that we can make math engaging and fun for our kids. Have you ever been in a workshop or meeting where the presenter talked on and on? Do you get fidgety or does your mind wander somewhere else? Well, I have a secret to tell you. Kids feel the same way. Try turning a lesson that may normally include a lecture and a worksheet into an interactive one. 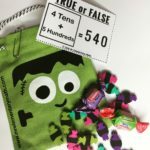 For example, you may have your kids place numbers on an interactive number line or guess the number of objects in a mystery bag. There are so many great picture books out there to use during your math lesson. 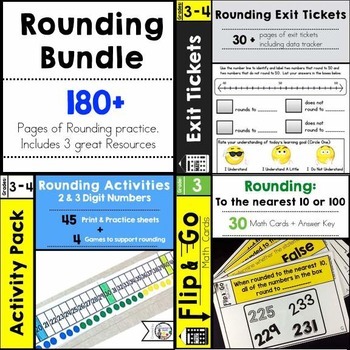 You can find topics that range from counting to multiplication. Read-alouds are ideal for drawing children into the math skill that will be taught. Who doesn’t like to play games? Games are the perfect way for students to learn and have fun at the same time. 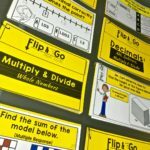 There are a wide variety of game types that you can use when teaching or reviewing math concepts. Off the top of my head, I can think of BINGO, War, Concentration, and the list goes on….. I think we all would agree that kids like to talk. 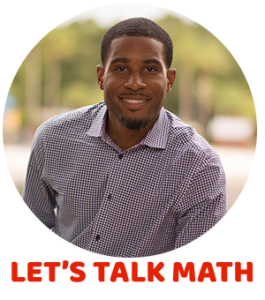 Model how to have meaningful conversations about math. And then allow time for these conversations to take place during your math block. This goes back to the above statement. Kids like to talk! So let’s ask them more open ended questions. An example of this may be to ask “Why did you use this strategy to solve the problem?” Also, try asking questions where there may be more than one answer. Kids will become motivated to find them all. Sometimes a little repetition is not a bad thing. In my teaching career, I have noticed one thing to be true. Kids love routines (even if they fight against them sometimes). Routines will help you maximize time because your students know the set expectations. As long as you keep the routines engaging, students will be tuned in and look forward to more. Kids love when we make learning more authentic. 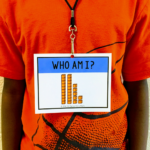 Try substituting student names in your word problems or using a math activity to introduce themselves to one another at the beginning of the year. There are so many cool math websites and apps that you can download to review math skills. Some of my favorites are Kahoot! and Math Game Time. The lessons that I remember the most when I was in elementary school involved the teacher using real objects to teach a concept. You can be really creative when teaching topics like geometry, measurement, graphing, addition…..just about any math topic. Try using a pumpkin to teach addition or use real items to solve a word problem. We know that children and adults have different learning styles, so mix things up a little bit and include activities where students have to get up and move. It can be a brief brain break that includes math or a longer activity that where students must sort themselves into groups. Either way, your kinesthetic learners will thank you. Creating an encouraging environment can help melt away the fear that some of our kids have about math. Cheers are a great way to motivate students. It is even more effective when students give cheers to each other. Drawing can be fun and educational. I believe strongly in the CPA (Concrete-Pictorial-Abstract) model. When teaching a math concept using the CPA model, kids first manipulate concrete objects, then move onto drawing models through picture representations and finally use only numbers and math symbols (which is abstract for them). Give students multiple opportunities to draw picture representations. This is where you can really see if students grasp the concept. Math manipulative for everyone! 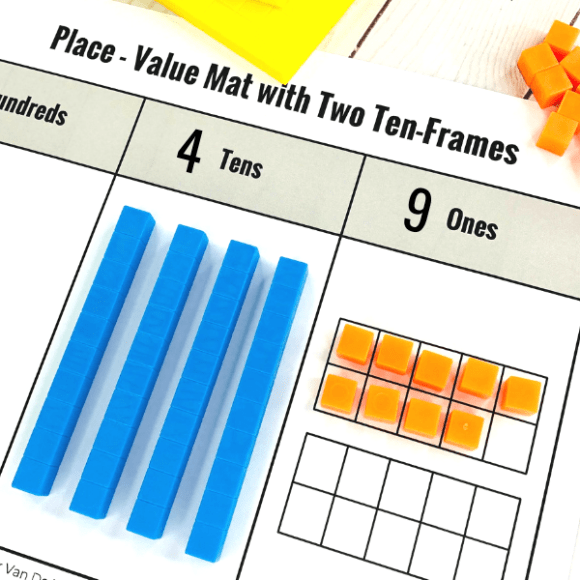 Contrary to popular belief math manipulatives are not only for kindergarten students. They are beneficial in all elementary grade levels. Going back to the CPA model, I have noticed that a lot of times teachers may skip this step. I was guilty too! However, this step is essential for conceptual learning. And if you don’t have access to any your school, you can make your own. Review doesn’t have to be just drill and kill. 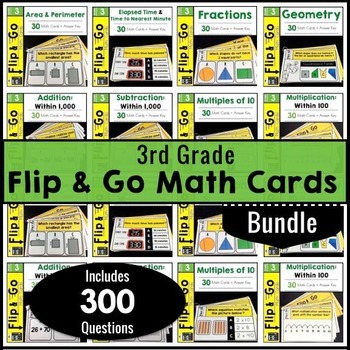 Math task cards offer a variety of enjoyable ways for your students to review and practice math skills. You can use them for partner practice, competition games or to play SCOOT. I don’t know about you but I have noticed that students are very attentive during science and social studies time. Use their natural curiosity about these topics to tie into your math lessons. For example, if you are teaching about goods and services in social studies, money would be a perfect connecting topic. If you are studying plants, measure their length with a ruler. Be creative! Create an environment where it is common for students to work in pairs or small teams. They can solve math problems and hold each other accountable. They will also enjoy working with their peers. Yes! This is a MUST! Share ways to make math fun with parents. You can even send home ideas for simple hands-on activities that parents can do with their kids. This way kids are getting the message at home and at school that math is not a scary subject. Fresh air is good for everyone. Go outside and do the same math lesson. Instead of paper and pencil, grab some chalk. Your kids will thank you. Make a BIG deal out of those special math times of the year. Namely, the 100th Day of School and Pi Day. Although these are the Big 2, you can come up with creative ways to celebrate student math accomplishments (i.e. knowing all of their multiplication facts) as well. Competition doesn’t have to be a bad word. Once students learn your expectations around competitions, you will see high levels of student engagement. And don’t forget, competition does not always have to be against another team or student. Some students like to set personal goals and compete against themselves. So, bring on the Math Fact Competitions! What do your students like about math? What do they find challenging? Create a Math Interest Survey and see what they want to learn about. Substitute a math task instead of a worksheet. There are many places where you can find grade level appropriate math tasks. Check them out and see what would work best for your kids. Food and math just seem to go together. In fact, I dedicated a whole Pinterest board to it. Have fun adding, subtracting, multiplying, dividing, measuring and graphing your students’ favorite foods. What better way to get kids excited about their own learning than to have them create problems for their classmates to solve? I have used this strategy in the past and have seen much success. Students LOVE to see the problems they create solved by their friends. They especially like inserting their names into word problems. This one is for all of you visual learners out here! Clear and student friendly visual representations are always a must when talking about student engagement. Visuals will hold their attention and help them better understand abstract ideas. Many times our kids get stumped when trying to solve a word problem. Have students actually act out the word problem using real life objects. This will help them “see” what is actually happening in the word problem. The extra bonus is that students work on their acting chops. Music is a great way to start a math lesson. You can even use it as a brain break. There are a lot of music resources on the web. Take a look around and see what you can find for your grade level. There are so many ways to differentiate a math lesson. You can differentiate by content (what is being learned), process (the actual activity) or the product (how student demonstrated mastery). You can breakdown many roadblocks for kids by meeting them where they are on their math journey. STEM projects by nature are very hands-on and cross-curricular. They also focus on real-world problems and are usually collaborative. So far that included 4 of the recommendations on this list. STEM projects can be a solid way for kids to love math (and science). Whew! That was a long list. 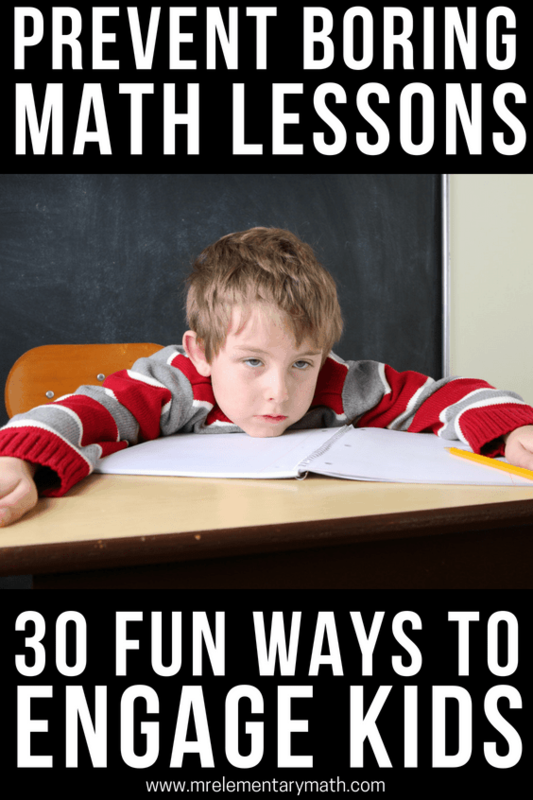 I hope that you will take away one or two ideas from this list and make math fun! Don’t forget to download the FREE checklist so that you can refer back to this Ultimate List of Ways to Make Math Fun anytime. 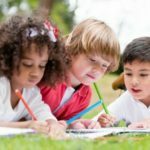 I never took into account that when teaching a math concept, you could have the kids move onto drawing models through picture representations before using numbers and math symboI never took into account that when teaching a math concept, you could have the kids move onto drawing models through picture representations before using numbers and math symbols. My son has a hard time grasping the more abstract symbols and I believe using pictures would help him. Thank you for the tips on the Concrete-Pictorial-Abstract model!ls. My son has a hard time grasping the more abstract symbols and I believe using pictures would help him. Thank you for the tips on the Concrete-Pictorial-Abstract model!